I always wanted to capture the colors of autumn. I am fascinated by the pictures of beautiful trees with combination of green, yellow and red leaves. Every fall season, the colorful display of leaves gives me the energy to get out of my comfort zone and capture those natural moments. But, because of work schedule, my fall trip was on hold for a long time. Finally, I couldn't wait any longer and decided to make a short trip to park nearby and capture the beauty of the season. This is probably one of my best shot in Skyline Drive. I really like how trees from both side coming close towards each other and the road is leading us from the center. On a sunny Tuesday afternoon, I took leave from work and headed to Skyline Drive in Virginia. The Drive is a 105-mile road that runs the entire length of the Shenandoah National Park in the Blue Ridge Mountains of Virginia, generally along the ridges of the mountains. 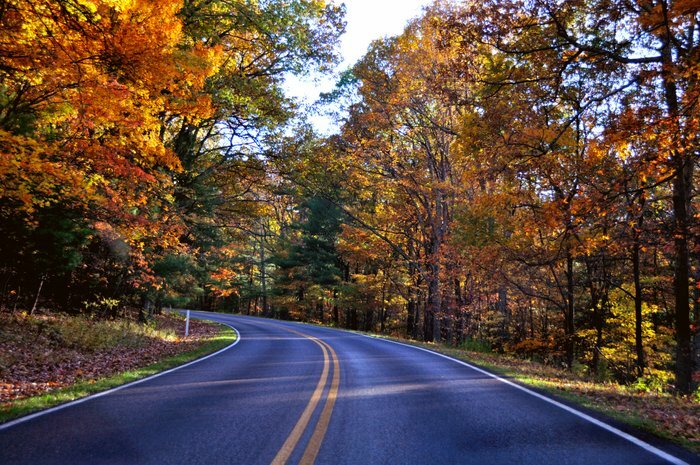 The scenic drive is particularly popular in the fall when the leaves are changing colors. According to Wikipedia, each year, over two million people visit the Skyline Drive, which has been designated a National Scenic Byway. The weather was so perfect that I didn't notice almost 90 miles of driving from my home. As soon as I reached the park, I saw an amazingly harmonious blend of nature and human development. Inside the park, you can't drive faster than 35 miles per hour due to curves on the road, wildlife crossings, and walking or cycling tourists. While driving, you can see stopped vehicles whose occupants are either enjoying the wildlife or viewing the valley from overlooks. As a driving precaution, you have to be extra careful about roads which take winding paths along the mountaintops where deer, bear and other wildlife crossing the road may appear without warning. If you go there during the peak of the season, you will be amazed by the colors. When you get the $15 dollar visitor ticket (it can be used an unlimited number of times throughout one week) at the entrance, you will also get maps and information about the National Park. There are nearly seventy-five overlooks throughout the drive, which offers some of the most spectacular views of the surrounding valleys. I didn't have much time to drive through all the overlooks but each one I visited was fantastic. The park is also famous for hiking and camping on its many trails and biking and horseback riding, on the roads. Please feel free to share your moments if you have been there and tell us what did you feel about the park.